My heart is overwhelmed today as I woke up this morning to the reality of the first ever African-American (bi-racial, to be exact) President-Elect of The United States! I kept the old Civil Rights theme song in my mind yesterday and today, "We Shall Overcome!" And now, not just African Americans, but all Americans have overcome. Now we can shout with hope and unity, "Yes We Can!" 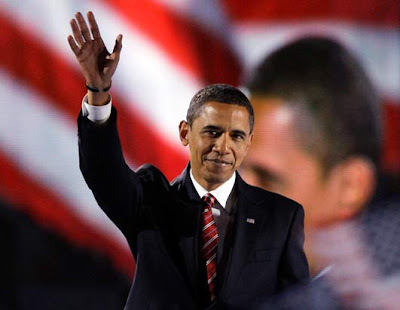 You can read President-Elect Barak Obama's acceptance speech here. My husband and I, along with some friends from church celebrated together last night at an election watch party. We screamed, cried tears of joy, reflected on the struggle of our parents, grandparents, & great-grandparents, and pinched ourselves in total disbelief! What about you? How did you celebrate this historical moment? What are your thoughts on our new president?